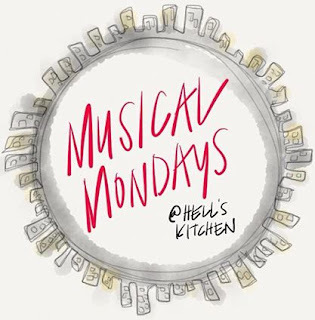 If you don't already know about Musical Mondays at Hell's Kitchen, well, you're hopelessly out of the local musical theater loop. This monthly cabaret series started about three and a half years ago and is still going strong. It's the best place to catch local music-theater talent in an informal environment. 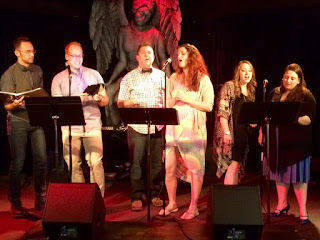 The theme of the 38th Musical Mondays last night was "The Lusty Month of May" and featured a fantastic cast of six, plus the ever charming hosts Sheena Janson and Max Wojtanowicz. I once again attended with some of my fellow Twin Cities Theater Bloggers including bloggers from One Girl, Two Cities, Minnesota Theater Love, The Room Where it Happens, American Underground, and Compendium. As usual, a great time was had by all! Daniel Greco: I saw Daniel a few weeks ago in Yellow Tree Theatre's Violet (closing this weekend!) and when I heard his voice I thought - where did this guy come from? I think and hope we will be seeing more of him on Twin Cities stages in the near future due to his lovely voice and expressive singing, evidenced last night by his rendition of "What Do I Need with Love" from Thoroughly Modern Millie and an achingly beautiful duet from Bridges of Madiscon County (which I am now excited to see at the Orpheum next month). You can next see Daniel performing at Icehouse on June 8. Doug Neithercott: for someone who says he doesn't do musical theater, he does pretty great musical theater, specifically, hilarious musical comedy (including an off-color version of "Grow For Me" from Little Shop of Horrors and an endearing "When Words Fail" from Shrek). Not surprising coming from the Artistic Director of the improv troupe Comedy Sportz. You can also see Doug in Youth Performance Company's Sideways Stories from Wayside School through May 15. Joey Miller: Joey is new to me but impressed on a funny caveman song "Ahead of My Time" and the adorable duet "Temp and the Receptionist." Joey will soon be joining the cast of Chanhassen Dinner Theatre's hugely entertaining Beauty and the Beast. Max Wojtanowicz: Max took time out from his hosting duties to perform a hilariously boozy "Pour Me a Man" from Miss Gulch Returns, a show he described as: "as if Miss Gulch from The Wizard of Oz did a cabaret of her own?" Molly Jo Schrade (née Hall): sadly Molly Jo (who was a pleasure to watch and listen to in several shows at Lyric Arts) has moved to Iowa, but happily she returned to grace us with her beautiful voice on such songs as the event's theme "The Lusty Month of May" from Camelot (Chanhassen's next show, opening this fall) and the other half of that achingly beautiful duet from Bridges of Madiscon County. Therese Walth: as good as creating a character as she is at singing, Therese entertained with several songs including "Gooch's Song" from Mame and the aforementioned adorable duet "Temp and the Receptionist." Therese will be performing with Second Fiddle Productions this fall. Zoe Pappas: it's a treat to see Zoe again after she sort of disappeared from the scene after such fantastic performances as the title role in Theater Latte Da's Evita several years ago. Maybe she's here to stay; she will be performing in the Ordway's upcoming Broadway Songbook: Kander and Ebb, and Second Fiddle's reading of A New Brain on May 23. One of the features of Musical Mondays is the ticket raffle, which you can enter for just $5 and win tickets so great local shows. This month's prizes included several pairs of tickets to Theater Latte Da's series of new musical workshops NEXT (starting this weekend) and the world premiere musical A Night in Olympus (opening Saturday at Illusion Theater). We were also treated to a song from the latter show, sung by one of the show's stars Tyler Michael accompanied by the show's arranger Robert Elhai. I saw a reading of the show a few years ago (written by Jeffrey Hatcher and Chan Poling, the team that gave us Glensheen) and am excited to see what it has become! The next Musical Mondays is on June 6, their annual Pride show. Watch their Facebook Page for more details.